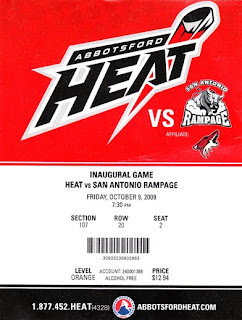 The family and I attended the inaugural game of the newest AHL team the Abbotsford Heat back on Friday, October 9, 2009. I am thrilled that the AHL has come to my area so that I can have the opportunity to see some of my favorite hockey teams come though town; Manitoba Moose, Grand Rapids Griffins, Houston Aeros, Milwaukee Admirals. I would be surprised if the team is still here in a few years though, if they do not make some big changes in ticket prices. I wanted to attend with my wife and 4 year old and also take my father in law who lives in Abbotsford and likes attending junior hockey games with us. The problem is that although the ticket price of $18 for upper bowl tickets was not unreasonable, the problem was in the fact that they were not willing to offer discounted tickets for my 4 year old son, or senior father in law, both of which are used to getting reduced cost tickets to other local games. Then there were all the extra service charges etc which I am also not used to paying when I attend a WHL or BCHL game. So, although I am a huge minor league hockey fan and really excited about seeing AHL hockey, I have only been to the inaugural game so far. I won't be attending another game until some in January, and mostly likely will attending the game on my own, leaving 3 other other possible ticket sales at home because of the ticket cost. I could understand not giving a discount for kids or seniors if they were selling out each game - why discount a seat that you can get full price for filling. But the trouble is that they are selling less than 50% of the seats for most games so far - even the inaugural home opener was not a sell out. They need to fill those seats and get people out to the games - and that won't happen if it costs a family of 4 over $100 to attend a game. Once they start offering discounted kids tickets and seniors tickets, they will have 4 more seats filled as I start attending games with my wife, son and father in law. Until that time, I will be listening to the games on the radio for free! *The ticket shown with the post was found on the floor after the game. Our actual tickets were just plain ticketmaster type tickets with no logos.